It was not until 1952 that a paved highway was built connecting this Sechelt to Gibsons and the rest of the Sunshine Coast. Prior to 1952 water access was the only way to reach the community. In 1986 the Shishalh People, were one of the first to achieve the right for self government. Shishalh is were the current village name was derived. The name Land Between Two Waters was derived from the fact that the community is sandwiched between the Inlet water on one side and the Pacific Ocean on the other. The distance in between is less than 1/2 a mile. If this section, made mostly of sand was not there, the area north of here would be an island! Sechelt Inlet is the inside waters, while the Pacific Ocean, Georgia Strait is the outer waters. The "Inlet" is actually comprised of three inlets, Sechelt Inlet being the largest. There is also Salmon Inlet and Narrows Inlet in the inside waters of the Area. The water flows into the inside waters from the entrance, near Egmont BC. This entrance is also known as the Skookumchuck Rapids. As a neat little note, over the years there has been talk of trenching a canal to join the two bodies of water! True west coast beauty at its finest, from beautiful forests including old growth, tumbling waterfalls and babbling brooks, towering mountains and pebbled beaches it is absolutely breathtaking. Year round activities can be enjoyed and climate is very moderate. A true west coast seaside community surrounded by snow capped mountains some of the year. 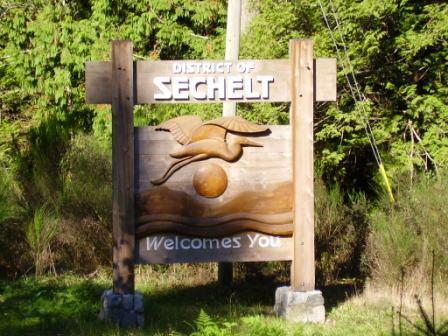 Find out more about the District-of-Sechelt here. Sechelt Public Library has public internet access for visitors and local residence. It is located at the North End of the village, in the same building as the District Offices. Rockwood Lodge in Sechelt is a historic building that now hosts the internationally acclaimed Festival of the Written Arts annually in August. Rockwood was originally built in 1935 as a boarding house & Union Steamship resort. The gardens around the lodge are spectacular and a perfect setting for a stroll back in time. Twelve Coast Salish Totem Poles look out over Trail Bay. The Totem Poles recount the history of the Sechelt Indian Band, the first in Canada to gain self-government in 1986. Today the community is thriving and there are many people that live in the area and commute into downtown Vancouver for work on a daily basis. This part of the coast is a bedroom community to Vancouver. If you are looking to relocate to the area, there are several excellent realtors in the area. For cool places to stay, including campgrounds, b&b's and hotels, check out B&B's and hotels, check out where to stay. You can find some really neat places, and "yes" there are some campgrounds! Sightseeing trips and day cruises are available out of the Inlet that are sure to please visitors and locals alike. 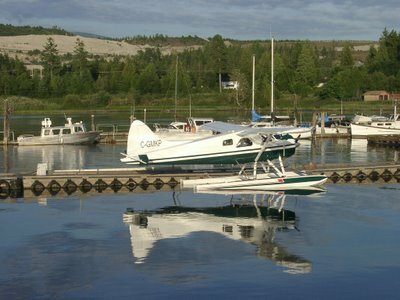 The inlet is also where you can find daily Sea Plane service to Vancouver and Vancouver Island. There are two different sea plane companies working out of the inlet. West Coast Air and Tofino Air. There are several sub-communities surrounding the area. There is Selma Park, Sandy Hook, Tuwanek, Porpoise Bay, West Porpoise Bay, and West Sechelt. While a few years back there was actually distance between these communities and the have now virtually blended together as the community has grown. Three elementary Schools and one high school service the area. A community centre and swimming pool was a new addition in 2008 and everyone is looking forward to the completion. An ice arena and golf course are also operating in West Porpoise Bay. Old Growth Timber can be found in the Caren Range, northwest of Sechelt. Some of the oldest western hemlock and yellow cedar in all of Western Canada grow in the Caren Provincial Park. The area is now protected, but not before trees over 2000 years old and some of the oldest in Canada were cut by logging companies and left to decompose. 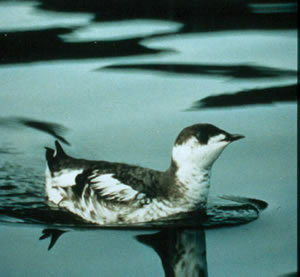 The Marbled Murrelet, a starling size seabird depends on the western hemlock for survival. The local Murrelets are now in decline due to the logging of the western hemlock that is found in the mountainous regions creating the backdrop for quaint community. The Marbled Murrelet lay their eggs on the western hemlocks broad limbs. Two types of sea lions, California and Stellar as well as common harbour seals gather in the winter months in the Straight of Georgia, and can be found at the mouth of the Chapman Creek, just south of Davis Bay. If you walk out on to the point, you may be able to catch a glimpse. Ask You Question About Sechelt Here! Do you have a question about Sechelt? Well, let's get you an answer! IS THERE A BUILDING SUPPLIES COMPANY IN SECHELT BC?